For other uses, see Alagoas (disambiguation). Alagoas (Portuguese pronunciation: [alɐˈɡoɐs], [ɐlɐˈɡow.wɐs]) is one of the 27 states of Brazil and is situated in the eastern part of the Northeast Region. It borders: Pernambuco (N and NW); Sergipe (S); Bahia (SW); and the Atlantic Ocean (E). It occupies an area of 27,767 km², being slightly larger than Haiti. Its capital is the city of Maceió. "For which is good and for prosperity"
It is the second smallest Brazilian state in area (larger only than Sergipe), and with Sergipe it is sometimes called the Rhode Island of Brazil. It is 16th in population. It is also one of the largest producers of sugarcane and coconuts in the country, and has an economy based on cattle raising. The Dutch invasion in Pernambuco was extended to Alagoas in 1631. The invaders were expelled in 1645, after intense fighting in Porto Calvo, leaving the economy in ruins. During the empire, the separatist and republican Confederation of the Equator (1824) received the support of noteworthy Alagoano figures. Throughout the 1840s, political life was marked by the conflict between the lisos (lit. "straights", not the sexual orientation connotation), conservatives, and the cabeludos (lit. "hairies"), liberals. Nicknamed the Land of the Marshals (Terra dos Marechais), for being the birthplace of Deodoro da Fonseca and Floriano Peixoto, Alagoas gave the country numerous illustrious Brazilians among whom are the anthropologist Arthur Ramos, the maestro Hekel Tavares, the philologist Aurélio Buarque de Holanda, the musicians Djavan and Hermeto Pascoal the poet Jorge de Lima, the jurists Pontes de Miranda and Marcos Bernardes de Mello, besides the writers Lêdo Ivo and Graciliano Ramos. Toque Beach (Praia do Toque) at night, Alagoas, Brazil. In the new terminal, Infraero also brings to Maceió “Aeroshopping” – a concept that is transforming the country's airports into centers for leisure and high-quality products and services. The entire building has a computerized air conditioning, with commercial spaces that will be occupied gradually. The parking area was more than tripled. Demand will be able to grow to 1.2 million passengers a year since the new passenger terminal has 24,000 square meters, the triple of its former size. The check-in counters were doubled and can reach higher numbers without any structural remodeling. The building is “intelligent”, meaning controlled by a computerized system that regulates factors ranging from the lighting level to air temperature and even the speed of the escalators. This system also controls access to restricted areas and the fire protection system, among others. 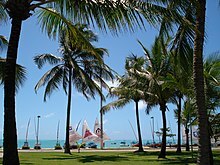 Alagoas provides visitors and residents with various sport activities. There are several football clubs based in the state, such as ASA de Arapiraca, CRB, CSA, Murici, Coruripe, CSE, Santa Rita, Penedense and Ipanema. Deodoro da Fonseca (1827-1892) - First president of Federative Republic of Brazil, 1889-1891. ^ The European Portuguese pronunciation is [ɐlɐˈɣoɐʃ]. ^ Verbete "Lac" Archived 2011-08-18 at the Wayback Machine Linternaute.com. Page visited on August 16, 2011. ^ Entry "Laguna" Archived 2011-06-08 at the Wayback Machine Diccionario de la Lengua Española. Page visited on August 16, 2011. ^ Entry "Laguna" Archived 2011-07-22 at the Wayback Machine. Dizionario Italiano. Page visited on August 16, 2011. ^ Entry "Lhagona" Archived 2011-07-14 at the Wayback Machine Dicionário da Língua Mirandesa. Page visited on August 16, 2011. ^ Why Alagoas? Archived 2012-08-02 at Archive.today Official site of the Civil Cabinet of the State of Alagoas. Pageg visited on August 16, 2011. ^ Sistema IBGE de Recuperação Automática (PDF) (in Portuguese). Alagoas, Brazil: IBGE. 2008. ISBN 85-240-3919-1. Archived from the original on June 14, 2011. Retrieved May 21, 2013. ^ a b "Always with us". The Economist. Archived from the original on 8 November 2017. Retrieved 30 April 2018.